Chalet Le Cœur Blanc is a truly luxurious detached ski chalet in the centre of St Martin de Belleville. The chalet was finished in 2018 and is brand new on our portfolio. The chalet owner is an artist which you will notice at soon as you enter the chalet. Therefore art lovers and collectors will feel at home in Chalet Le Cœur Blanc. There are 4 en-suite bedrooms in this spacious chalet. Three of these can be found on the floor above the underground garage. All three rooms open up onto a huge sun terrace with breathtaking views of the surrounding mountains. The master en-suite bedroom is situated on the floor above the living and dining area – Away from the rest. In the middle lies the heart of the chalet. A huge open-plan kitchen, living and dining area with central fireplace. Large windows from floor to ceiling offer stunning views of St Martin de Belleville and its mountain backdrop. French doors open up onto two spacious balconies with outdoor seating. All in all, it’s a dream chalet for taking in the views! Chalet Le Cœur Blanc features a separate boot room with boot warmers, a TV snug with game console, movies and games (ideal for teenagers to hide away), a utility room with a washing machine and dryer as well as a large underground garage with private parking for two cars. Only a few minutes walk down the road to the drag-lift and all village amenities mean that you have the comfort of everything being within walking-distance. However without the hustle and bustle of being right in the centre. The ski slopes can also be reached via a 5-minute walk along a quiet residential road flat to the edge of the slopes, from where you can ski down to the village drag lift. Chalet Le Cœur Blanc occupies an elevated position. Looking over the entire village of St Martin de Belleville and the mountains in the background. 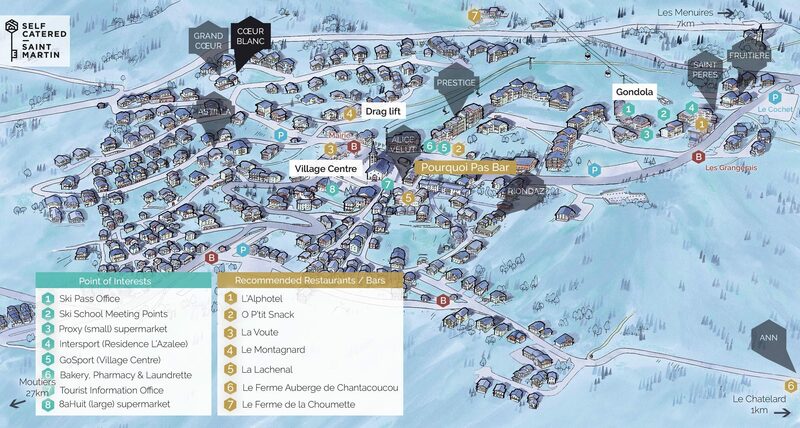 The prices above allow up to 8 people in ‘Chalet Le Cœur Blanc’. An 9th/10th person can be added (sleeping on the sofa beds in the TV snug). Our ‘extra person fee’ applies.